It's October and time to get ready for Halloween themed bingo! Find all the spooktacular specials here! The tombola Roller-Coaster balls are preparing for their Halloween costumes to play in the Halloween RollerCoaster spectacular. Be there on 28th and 29th October and you could win £175 per game between 8pm-10pm! There are some huge Full House prizes on their way in bingo90 at 9pm on Tuesday 31st October. Get your tickets for a chance to win £20,000! For the month of October, three US friendly bingo sites will offer a wicked No Deposit Bonus for new players! Register and get an EXCLUSIVE $25 free bingo bonus + 20 Free Spins for CyberBingo. Get 10 Free spins and $25 when you sign up at Bingo Fest and BingoSpirit. You can WIN £750 Real Cash every week! 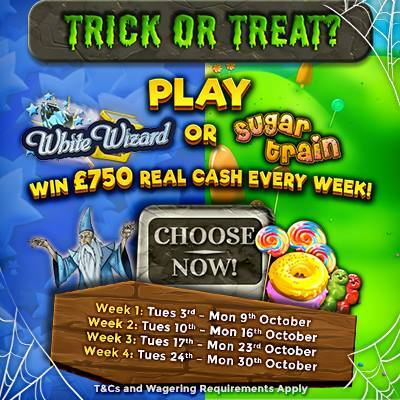 Deposit a minimum of £25 each week and collect 1 draw entry per £1 wagered on White Wizard, White Wizard Deluxe or Sugar Train! Winners will be announced every Tuesday morning! Get spooky and best of luck! Each of the House Of Horrors code must be redeemed in order to unlock the $200 free chip code. Free chip comes with a 3X wagering requirement on Bingo, 30X on Slots & Keno and 45X on other allowed games, a 1X max allowed cash-out, will only be credited once per player (only if you redeemed all required House of Horrors codes in order prior to redemption), and is good for play in all allowed games. Chip amount is considered cashable and will not be removed from the amount of your withdrawal request. Open to all funded players. Winners will be notified by Monday 16th. Celebrate Halloween early and claim some sweet treats! Also, 10 players that win in the Bingo Buddies Room will win Halloween sweets. Rack up points for winning during any of the H.A.L.L.O.W.E.E.N patterns in the Bingo Buddies Room. P.S. New sign-ups also get a $3 LBB Chip when registering via our link and making a 1st deposit. Be there on October 31st for a chance to win £5k jackpot at 9pm! Tickets will be on sale for 50p. Hallo-Win is a 75-ball bingo game that plays at 11pm on 31st October. Buy cards in the Lobby for 10p! The game prize is a Rotisserie Mini Table Top Oven in the form of an Amazon voucher to the value of the prize, plus a £50 TESCO voucher. The cash alternative is £250. 1TG winners will share £150 cash, 2TG winners will share £100 cash. The Winner(s) will be contacted via email on 01 November 2017. Win a £250 Terrorvision package that includes a Panasonic LED TV and the complete collections of American Horror Story and Paranormal Activity. 1TG and 2TG winners also share £250 of cash! Terrorvision is a 75 ball game which plays on 31 October 2017 at 11pm. Cards are available to purchase for 10p each in the Lobby. Hi LBB'ers, Big Love Bingo is offering some spooky promos! Every £10 cash wager on bingo and £50 cash wager on slots will get you one entry into the £10K prize draw! Wager across selected spooky slots between Thursday 26th& Tuesday 31st October 2017 and if you make it into top 10 leaderboard you'll win a share of £1,000 cash bonus! Join the thrilling £3K Jackpot at 11 pm GMT on 31st October 2017. Use the special coupon code HALLOWEEN to avail up to 100% cash bonus capped at £100 on each deposit between Thursday 26th October and Tuesday 31st October. Month end offers valid from 26th October – 31st October 2017. 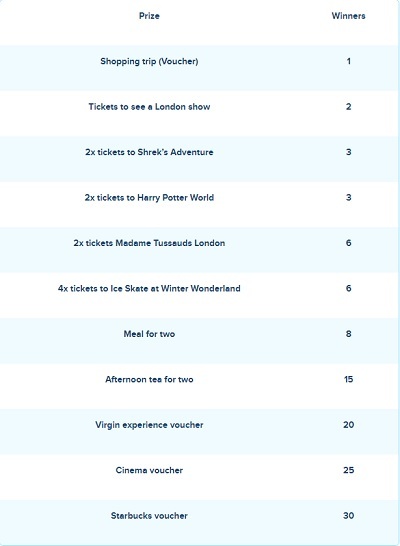 Go visit Cyber Bingo and enjoy in these fabulous promotions! On Monday October 30th enter the code: EVILZOMBIE to receive a $3.00 Free Play Bonus! and unlock a special zombie treat of an extra $35.00 bonus by entering the code TREAT2017! Each Zombie can only be claimed once and must be claimed between 12:01AM EDT and 11:59PM EDT on its specified date. Log in to your Lucky Pants Bingo account. Valid on your first deposit of minimum £10 upon entering the promo code HOWL in the cashier. The 50 spins will be credited as a £12.50 slots bonus for you to play on Howling Fun. Spins Bonus will expire after 7 days. Enjoy your 50 Spins (credited as bonus)! This offer is only valid on your first deposit of minimum £10 upon entering promo code MUERTO in the cashier. 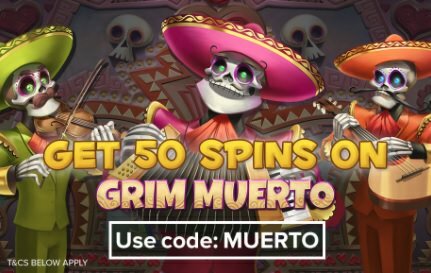 The 50 spins will be credited as a £10 slots bonus for you to play on Grim Muerto & Grim Muerto - mobile. The 50 Spins calculated on max pay-lines (20) at 1p per line x 50 spin=£10.00. After 7 days the remaining bonus amount and winnings will be automatically removed from the account. 50% Bingo Bonus and 10 Howling Fun slot spins. Can be used 10 times. Deposit a minimum of £10 today, Tuesday October 31, 2017. 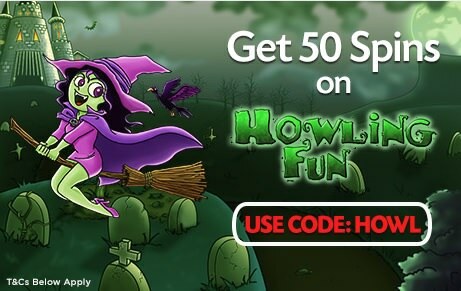 Use code TRICK for 25 Free Spins or TREAT for a £5 Bonus.